how does change happen on the land? The Edmund Hillary Fellowship just published this great article about Severine! There is a question we need to ask when talking about food production. The question is, “Who is telling what story, and on whose behalf?” Is it a story that goes with dinner? Or does it perhaps focus on the “We feed the world” narrative so dominant in the agricultural and general press these days? That story goes something like this: We (Read: developed world) need to grow food as quickly, cheaply, and efficiently as possible in order to be able to feed a growing (Read under-developed world) population that is growing at a rate of change faster than we can keep up with. Crops are necessarily bred for maximum size, yield, speed to harvest, and disease-resistance, while taste, diversity and nutritional value considered somewhat irrelevant. We are told this is the only way to keep up with our growing population. If we are to believe the predominant narrative, there is no other way to feed a rapidly growing global population. Simultaneously, there is a crisis looming across much of the developed world. Bluntly put, farmers are becoming a dying breed. The older generation is retiring, while their children and grandchildren now have alternative options available to them — they’re moving to the cities, they’re chasing a multitude of new career opportunities, they are no longer opting for a hard day’s labour in the dirt. They’re not taking on the family farm, the way that generations before have done since the dawn of the agricultural age. I wrote about the future of farming a couple of years ago, and New Zealand’s golden opportunity to leverage our natural advantages to become a premium producer of sustainably-produced agricultural products, that regenerate the land. Now, we can look to the far northeast at a number of growing movements that can offer a potential pathway for New Zealand’s agricultural transformation. Across the Pacific, there is a seed of hoping springing forth. There are radical new green shoots breaking through the endless monocultures that sprawl across the midwestern United States. There is a new movement of young farmers, who recognise that short term thinking and the ecological damage inherent in the industrial food system, is leading us rapidly towards the edge of the proverbial cliff. At the coal face of this movement is Severine von Tscharner Fleming, based in Champlain Valley, New York. In the past few years, members of Edmund Hillary Fellowship team have been connecting with communities who are leading global work around building a robust, sustainable and healthy food system. In conversation with diverse groups from Bioneers to the Near Future Summit and EAT Forum, people everywhere have told us “You’ve got to connect with Severine”. It seems that within both new and ancient holistic farming circles, all roads lead to Severine. Speaking in the video below at New Frontiers festival in New Zealand earlier this year, Severine describes farming in America today as both a privilege and a service. She has co-founded, led and been involved in a number of different initiatives to bring young people back to the land, and stands as a dedicated voice for regenerative agriculture and land reform. And there is a growing chorus of voices behind her, walking the talk and providing the collective roadmap to feed the planet in a healthy, sustainable way. Her talk at New Frontiers was entitled “The Project is Land Repair”. This title alone provides an insight into how a generation of young farmers are thinking about what they do. Natural ecosystems are very good at repairing themselves. Plants and trees provide organic matter to the soil below, which composts alongside waste matter from passing animals and birds. This provides the land with the right nutrients that it needs to thrive. The protective canopy of plants drip feeds water to the land, while providing a root system that keeps the soil in place, and shade that keeps moisture in and provides a home for countless helpful bugs and microorganisms. Dozens of other symbiotic exchanges occur to keep the ecosystem in balance. Monoculture farming strips all of this away. We have placed value on only some parts of the ecological system, devaluing others, removing some crucial parts altogether, and resulting in degraded land. Decades of abuse at the hands of the “produce-as-much-as-you-can-at-all-costs-with-as-little-land-as-possible” mentality, has left millions of acres of agricultural land in dire need of repair. The young farmers at the spearhead of this land repair movement have a name — the Greenhorns — and they are bringing the “human” back into farming. Greenhorns is a grassroots organisation founded by Severine, with the mission to recruit, promote and support the rising generation of new farmers in America. Or as Severine put it, “it’s about the recruitment of bodies back onto the land.” An identity as well as an organisation, the people who call themselves Greenhorns are those that are embracing farming as a calling and a way of life. It started with a film project of the same name in 2011, after Severine spent three years travelling across America interviewing young farmers. Originally a platform to broadcast the voices and visions of young farmers, it has now grown to a thriving nationwide community that produces literary journals, almanacs, a popular blog, a weekly radio show, a short film series, and a national OPEN GIS farmer database, while also hosting a variety of social and political events. On a broad level, the work of the Greenhorns is to provide the cultural infrastructure required to inspire an agrarian revolution. — Severine von Tscharner Fleming, from her Director’s Statement, Greenhorns website. Growing food on the land is inherently complex. A core principle of the practice of permaculture and regenerative agriculture is that there are no “fix all” solutions — what might work or be right for one farm, may not be the solution for a farm 10km down the road. This makes it all the more crucial for young people to take up the mantle of farming. It is not just the practical advice and knowledge of farming in general that is being lost, but the wealth of intricate knowledge relating to one particular piece of land, that is passed down from generations of experience, and trial and error. We risk losing the years of observation, trust and instinct that has built up over time between humans and the land that sustains us. Consequently, many Greenhorns take on apprenticeships on certain farming lineages, being mentored by elders who have entered into a lifelong relationship with a certain piece of land. The Greenhorns are technologically-savvy. Not in the hulking great John-Deere, proprietary-programmed, laser-precision, you-don’t-actually-own your-tractor kind of way (there’s a movement of it’s own tackling that particular challenge to farmers’ autonomy) — but in the kind of way that brings together new ideas, open source models and operating systems to the age-old farming traditions of fixing, fabricating, tweaking and improving the tools of the trade. 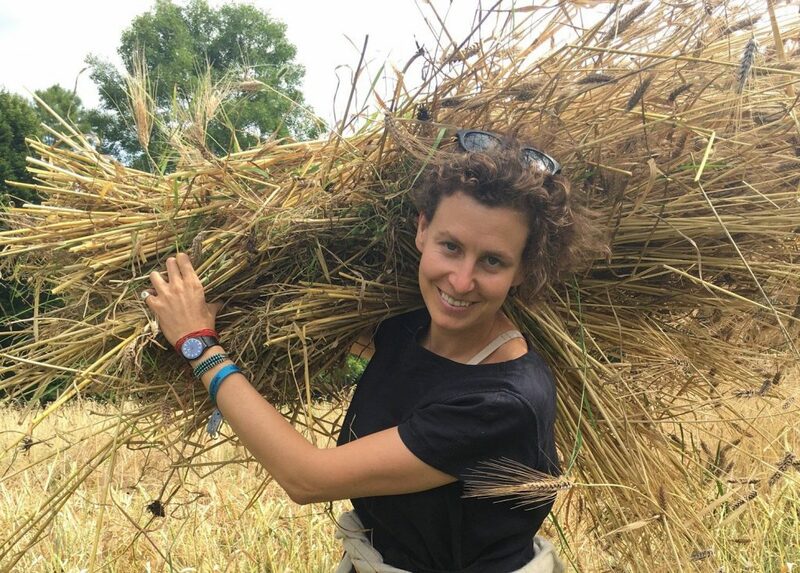 Severine is the Co-founder and Board President of Farmhack — a community of farmers, engineers, architects and designers who embrace peer-learning and a DIY attitude to get on with the job. Elders share their successes and mistakes, the Greenhorns bring the tech savviness of the younger generation, and the whole project thrives on collaboration. There are more than 1 million people signed up to the open-source Farmhack platform across the world, from Italy to Guatamala. From mobile biodiesel processing trailers and cycle-driven threshers, to solar powered pasture monitoring systems, to open source farm operating systems and smart, connected sensors, Farmhack provides DIY solutions for every kind of small-farming problem. Within the narrative of our current society, Severine describes the character she plays as one who bucks all trends and advice about what you should do with your life, to toil under the hot sun, working hard with humility, for very little money. It’s an interesting indication of how our current economic system assigns value, that farmers work harder than almost anyone and yet are generally paid pittance. Herein lies one of the roots of the looming crisis — growing the sustenance that literally every single human inhabitant of this planet needs to survive offers a marginal economic livelihood. In the US, 70% of farm work is done by people who do not have citizen status, many of whom are at risk of deportation and exploitation. Yet without them, the whole system falls down. One of the biggest challenges has been the soaring cost agricultural land. Most of the agricultural land is owned by people over the age of 70, and the people who have chosen agriculture from a young age without inherited family land are in no position to own the means of production. “You cannot afford to buy the land, with the food you grow from it.”— Severine Von Tscharner Fleming. Enter the Agrarian Trust, Severine’s latest startup. The Agrarian Trust’s mission is to support land access for next generation farmers, focusing on the permanent protection of affordable organic farmland. It holds precious farmland in trust for its best use — sustainable food production and ecological stewardship. The organisation began after Severine began to research other models around the world where access to the means of food production has been more equitable and sustainable. As she puts it, she was looking for “the places where the commons are not tragic”, and where land reform has happened in healthy ways. In many of these examples, diverse community stakeholders have come together to explore new forms of land ownership and management, governance structures and indigenous approaches to cultivating a relationship with the land. Teaching herself to use Github, Severine brought together all this diverse research and knowledge from around the world, and with the help of some supportive lawyers in Oakland, developed the Agrarian Trust as a new community land trust. Many of these stories were told at the Our Land symposium, the videos of which are available to watch here. In one example in France, 112 farms are held in common ownership, and leased to farmers for the duration of their lifetime, who in turn grow food for the local community. Thousands of cooperative members have invested an average $5,000 each, collectively making decisions about the management of the land. Co-operatives are of course nothing new to New Zealand. Our nation’s most profitable company Fonterra, is after all a dairy cooperative that can trace it’s roots back to 1871. Fonterra has done a great job of keeping milk prices at a level where dairy farmers can survive, yet the scale and intensity at which the dairy sector in New Zealand operates in order to keep the lights on, has had devastating effects on our environment. The challenge for community held land cooperatives as they start to grow bigger will be ensure that their ecological values and purpose are held firmly at the centre of what they do. None of this work can happen without the political will to change our food production system. The large powerful industrial players in the United States receive massive subsidies, and they are politically ingrained at all levels. The National Young Farmers Coalition formed in 2009, and exists to represent, mobilise and lobby on behalf of family farmers. Supporting fair labour, sustainable farming practice, affordable land, peer training, and inclusivity in the farming sector, this group stands in stark contrast to the well-funded industrial farming lobby, in a David vs Goliath battle for the midwest. As an early advisory board member, Severine describes attending a recent conference run by a conventional young farmers group on behalf of the Coalition. With the help of some sponsorship the Coalition secured a booth spot at the conference, somewhat perversely named The Hunger Games, and managed to run out of all their handouts and resources long before the end of the conference. What this indicates is that there is a strong interest from young farmers across the spectrum to stand independently, and join a movement ensure their continued livelihoods and the production of sustainable, healthy food. The battle is an uphill one, and often a thankless one. But between the Greenhorns providing the community, Farmhack collating the know-how, the Agrarian Trust securing the much needed land, and the Young Farmer’s Coalition working to change mindsets at every level from the grassroots to federal policy, the movement that Severine von Tscharner Fleming has helped build is well placed to continue growing in momentum, and offer a shining example for the rest of the world to follow. Thank you to the Edmund Hillary Fellowship, click HERE to check out their website and their other great posts. new farmer’s almanac submission time!